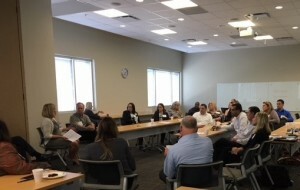 Credit professionals from PESA member companies gathered at the 2017 PESA Credit Interchange Division Annual Meeting on October 19 for networking opportunities, training on how to best utilize the CID platform and presentations from industry experts. With more than 30 member companies, PESA-CID creates a unique opportunity for credit professionals to exchange trade credit information and histories on more than 10,000 customers. This data provides a cost-effective way for members to anticipate and reduce financial risk. Additionally, the program provides a strong network of credit professionals. 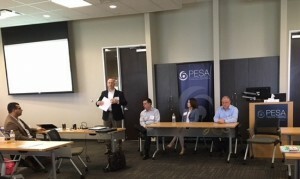 Speakers, including those from Key Energy, OFS Portal, ABC Amega and Professional Alternatives, along with a panel of PESA Industry Members shared their expertise through presentations and engaging discussions. 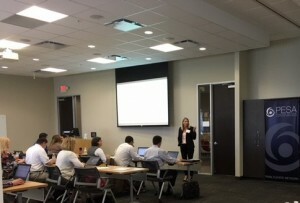 Topics of discussion included Ecommerce – Credit & Collections: Order to Cash (DSO), Ecommerce – Introduction and Best Practices, Credit Reports & Becoming a File Submitter, and Personal Investment & Development. Ross Guthrie, Vice President Order to Cash, Key Energy, provided insight on how Credit Departments Add Organizational Value and the Benefits of an Order-To-Cash Organization. “Order-to-cash organizations create a 20-day improvement, going from 75 days down to 55 days,” stated Guthrie. Chris Welsh, CEO, OFS Portal, discussed the importance of E-commerce and its role in the oil and gas industry. James Criswell, Regional VP, Professional Alternatives, provided insight into Personal Investment and Development during candidate and company-driven markets. CID Operating Committee members also reviewed the new CID billing structure in detail. Additionally, PESA held an election for two CID Operating Committee Members and updated its policies to facilitate increased member engagement. Congratulations to the 2017-2018 PESA Operating Committee: Committee Chairman Randy Friedsam, Select Energy Services; Don Burell, Schlumberger; Doug Dunlap, TETRA Technologies; Lauri McDonald, Nabors; Kristy Woolsey, DistributionNOW; and newly elected committee members: Kara Griffith, Newpark Resources, Inc.; and Darin Day, National Oilwell Varco. Our sincerest thanks to Ross Guthrie, outgoing CID Operating Committee member and former Chairman, for his dedication and contribution to PESA-CID over the years.